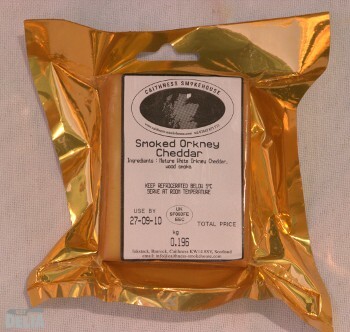 After visiting the Caithness Smokehouse I had the delightful “job” of sampling some smoked Orkney cheddar. This is mature white cheddar from Orkney flavoured with wood smoke in the Caithness Smokehouse. John Inglis uses beech, oak, and chopped-up old whisky barrels to provide the unique smoky taste. I agree that it is indeed a unique taste, and very tasty indeed! As it happened, we were off to Malta straight after our smokehouse visit, and the cheese survived the journey without any problem. I invited our hosts to try some. One of them was a bit hesitant as he said he didn’t usually like smoked cheese but he tried it anyway and pronounced it delicious. We think that it’s because this cheddar is an artisan product made with care rather than the result of some industrial process like some of the cheeses which are mass produced for supermarkets. As a result it has a delicious, complex and subtle smoky flavour which enhances the cheese rather than overpowering it. Your suggestion to try the Orkney smoked on cauliflower cheese has just been tried by this humble correspondent. I can tell you it is Utopia on cauli and cheese, especially with a home grown cauli. I am still salivating, though it’s long gone. Ooh! Why did you not tell us you had cauliflowers when we were staying with you? Yeah, maybe you were afraid that we’d eat them all. Gotta say that food in Caithness is the best I’ve had in years! Everything was just perfect, thanks.